Father, Alvin Fielder Sr., studied coronet. Mother played piano and violin; grandmother played piano; mother’s brother played clarinet. Brother, William, is Director of Jazz Studies, trumpeter, and trumpet instructor at Rutgers University. At 13, Alvin Fielder began musical studies by joining Harris Senior High Band in Meridian, Mississippi, under leadership of Carlia “Duke” Otis. Alvin continued studies with Ed Blackwell while in New Orleans studying pharmacy at Xavier U. in 1952-53. After transferring to Texas Southern U. in Houston, TX, he continued course of study with Herb Brockstein as well as private lessons with George “Dude” Brown, Gene Ammons, drummer from Washington, DC, and Clarence Johnston, James Moody’s drummer, from Boston, MA, whenever they came through Houston working. Alvin also had informal lessons with Jual Curtis and G.T. Hogan. From 1954-56, Alvin worked with the “Pluma” Davis sextet, which included Don Wilkerson, Richard “Dicky Boy” Lillie, John Browning, Carl Lott, Cr., and many other Houston jazz luminaries. He backed such artists as Lowell Fulsom, Amos Milburn and other R&B artists with extended engagements in Houston. Alvin also made several studio dates for Duke records. He was also active on Houston jazz scene with Jimmy Harrison Quintet, John Browning quintet, and Eddie “Cleanhead” Vinson sextet. From 1959 to 1968, Alvin was active in Chicago with: Sun Ra Arkestra 1960-61, Muhal Richard Abrams 1962-63, Roscoe Mitchell 1963-66, Eddie Harris and Kalaparusha 1965, co-op trio with Fred Anderson and Lester Lashley 1967-69. In between, he worked with John Stubblefield, Jack DeJohnette, “Scotty” Holt, Joseph Jarman, and other Chicago jazz musicians. Alvin is a charter member of AACM with Muhal Abrams, Roscoe Mitchell, Fred Anderson, Malachi Favors, Jodie Christian, Steve McCall, Phil Cohran, Thurman Barker, Ajaramu, Charles Clark, Christopher Gaddy, Freddy Berry, etc. Alvin moved back to Mississippi in late 1968 to take over family pharmacy due to father’s illness. 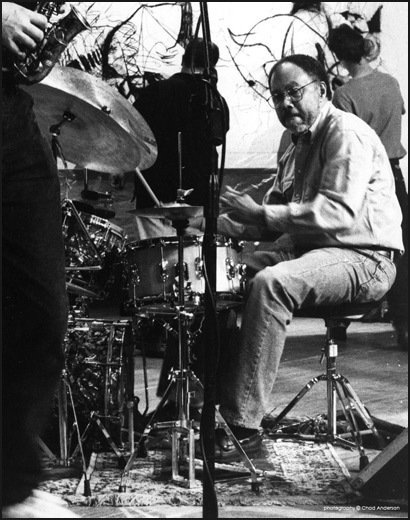 With John Reese and Black Arts Music Society, Alvin was active in obtaining grants from NEA and Mississippi Arts Commission to bring musicians such as Roscoe Mitchell, John Stubblefield, Malachi Favors, Muhal Richard Abrams, Clifford Jordan and others to Mississippi. Alvin worked extensively in early 1970s with Joe Jennings, alto saxophonist now in Atlanta, and Edward “Kidd” Jordan, multi-saxophonist from New Orleans, with whom he co-leads the Improvisational Arts quintet. One of the most important new music groups in the South, IAQ has included at various times Clyde Kerr, trumpet; Alvin Thomas, tenor saxophone; London Branch, Elton Herron, basses; Darryl Levine, piano; Kent Jordan, flute. Also worked with Dennis Gonzalez, trumpeter and multi-instrumentalist from Dallas, another leader on the new music scene in Dallas and TX. Alvin also had a founding role in the nationally-acclaimed Louis “Satchmo” Armstrong Jazz Camp in New Orleans, LA. Alvin has been involved with this growing program since it began in 1995. Appearances include Lincoln Center, Chicago; NO Jazz & Heritage Festival; Jazz Marathon ’82 Festival, Holland; Moers Intl. New Jazz Festival, Germany 1982; Jazz Danes LA Drones Festival, France 1984; Northsea Jazz Festival, Netherlands 1984; Heinekin Jazz Festival, Netherlands 1988; Atlanta and Texas jazz festivals 1989; Festival Intl. de Louisiane 1991.
attempted violation recoils on the head of the violator. Dear Friend Alvin Fielder : For me, music is a sacred thing. My name is Gustavo Adolfo Bustamante.I am promoter of contemporary classical and classical music in the west of Antioquia State,Colombia. Basically I do this cultural activity of promotion in two means of communication here: a radio station called Sinigual FM Stereo, 93.3. This station belongs to UCO,spanish initial for Universidad Católica del Oriente,West Catolic University (www.uco.edu.co/sinigual) *.Here I have the program ,” Ritmos en Jazz ” and others. Would you please give me a free promotional of your music for this programs. I am faithful listener of your music and I’d like to share with my radio station listeners your extensive stock of music.Your work is a valuable contribution to my human and cultural growth. Hi Brother Alvin. I love your music and drums a lot and from the depth of my soul. I have collected most of your music but it is difficult to find in our country. Albert Risimati, jazz collector from Giyani, Republic of South Africa. YOU MIGHT NOT REMEMBER ME .WHEN YOU WERE IN MERIDIAN WE HUNG OUT.WE USE TO LISTEN TO MUSIC AND YOU TOLD ME THINGS ABOUT JAZZ.JUST WANTED TO SAY HI AND THANK.THIS WAS WHEN YOU WERE AT FIELDER & BROOKS. I just wanted say LOVE LOVE YOUR MUSIC. Oh the talent that comes out of Mississippi. I am a huge collector of all that is jazz. My favorite to collect is your music. We are heading towards 2015! What’s Alvin doing lately and where does he live? Alvin is one of the most inspiring men in my life.